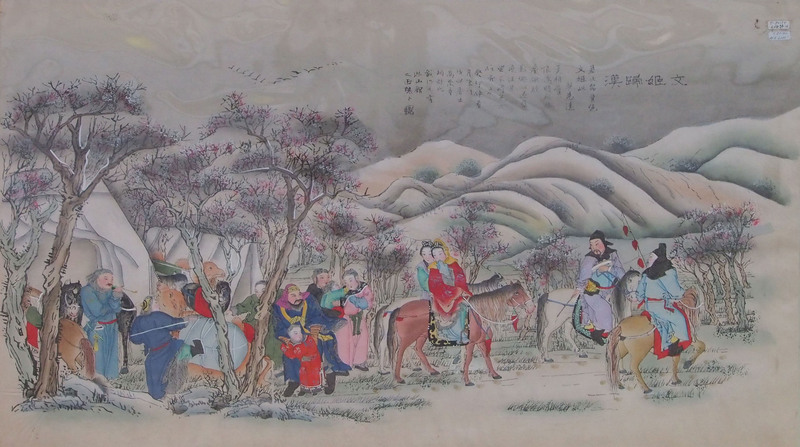 This Yang Liu Qing print is about the story “Wenji Reurning to Han”. Wenji, was the daughter of the scholar Cai Yong, equally well learnt she was tributed to have revived some important ancient literature that was lost during the war. Wenji though has a rather tough life; her first husband Wei passed away and during the war she was kidnapped by the Huns tribe and made to be the queen of the Hun king. The king treated her well, they had children and soon Wenji though missing home was well settled in Hun. Happy to see her, Emperor Cao Cao felt bad that she is all alone and without a family so he arranged for her to be wedded to an official named Dong. Unfortunately, Dong committed some crime and received a death sentence. Wenji fearing she will lose yet another husband went to see Cao Cao and begged for his pardon. Moved by her action, Cao Cao ordered for Dong’s release and chatted with her about her father’s literature. Wenji told him that all the 4000 odd books were destroyed during the war but she could still recite 400 out of the 4000. Cao Cao was excited to record the lost literature and Wenji wrote them down word for word. Click here to see our other Yang Liu Qing prints.